If anyone had told me I could say to a first-time client, whose horse (not just any horse, but an extremely talented international show jumper) we had had for a week: “I’m sorry, we can’t get your horse into the swimming pool now. I’m going on holiday, so I think it’s best you come pick him up. You’re welcome to bring him back when I return, and we’ll try again.” and the client would actually do just that, I would’ve told you you were crazy. And yet: that’s exactly what happened. 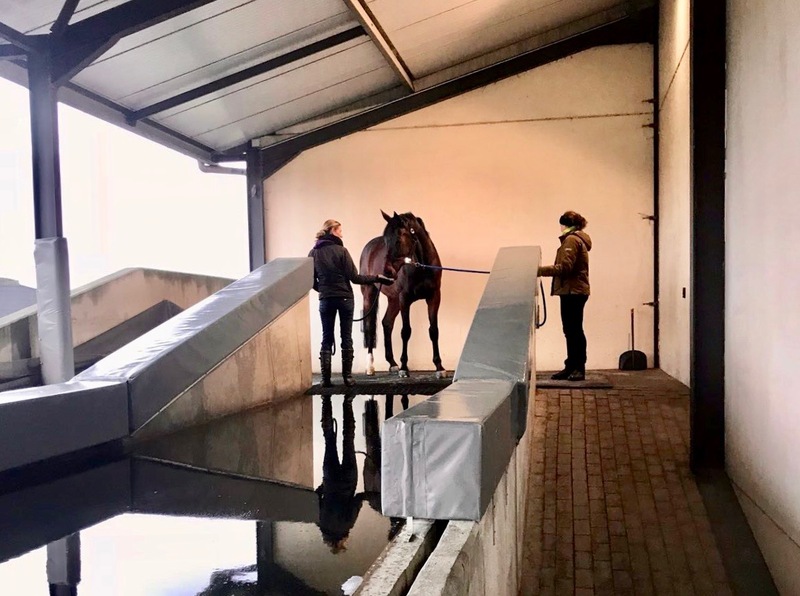 I had kept the client informed over the course of the first week… and the second week when he brought the horse back and we still could not get him to set a foot into the swimming pool. It took us about 20 hours over 2 weeks, but eventually the horse swam! This horse wasn’t ‘stubborn’, ‘headstrong’ or ‘obnoxious’. He was genuinely terrified. Some days, we got a little bit further (I mean that literally: one or two centimeters further). Other days, he wouldn’t get within half a meter of the water. After swimming close to 300 horses, only 3 or 4 of which had ever swam before, I’m still learning. There’s no step-by-step plan, where if you just follow all the steps the horse will swim. The only constant is patience, without pressure. We could, of course, use pressure. Funnily enough, it’s often the horse’s owner who encourages us to do so (usually because they get uncomfortable if they feel it’s taking too long). However, using force often causes the horse to jump in to the swimming pool to escape that pressure. When they jump, we can not control them. This puts not only the horse, but also myself and my staff in danger. It also makes the next time the horse has to go into the pool a lot more difficult: we have a scared horse, that doesn’t understand how he got into the pool last time and is now also scared of the pressure he knows is coming. So, back to patience. On average, it takes about 15-20 minutes to get a horse to swim for the first time. Sometimes not even a minute, and sometimes (very, very rarely, thank goodness!) well… over 2 weeks. Horses don’t often show their fear, as this is weakness and in nature that’s what gets them killed. Every time we’ve had a ‘difficult’ horse to swim, we’ve realised sooner or later that it’s just fear holding it back. Fear knows only one master: understanding. Getting a horse to swim for the first time is getting it to understand what you’re asking it to do, and how to do that. So a well-meant thank you to all the horse-owners who put their faith in us, and give us the time to do what we do!